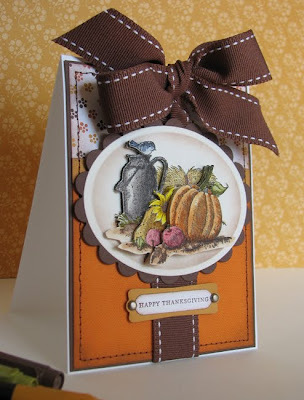 Scrapping Mommy: Happy Thanksgiving!! Favorite Harvest Card and Giveaway!! Happy Thanksgiving!! Favorite Harvest Card and Giveaway!! This card is from November 2009. I colored the image with Stampin' Up! markers and layered 4 different images together with dimensional adhesive for a 3-D look. You can see all the details for this card HERE. 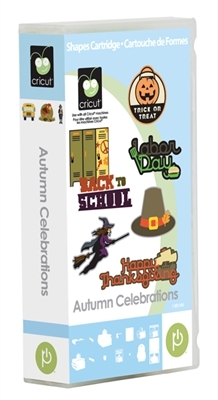 Since I didn't have a new card to share with you today, how about I give away a new Autumn Celebrations cartridge to one lucky reader?? Leave a comment below telling me your favorite thing about Autumn. Be a public follower or email subscriber to my blog (links in the right side column) and then leave a comment below letting me know that you are. Like Scrapping Mommy on facebook and leave a comment below letting me know that did. Share this giveaway on your blog, facebook, twitter, or via email and leave a comment with how you shared this giveaway. You have four chances to enter....be sure to leave a separate comment for each one. I will draw a winner via random.org on Tuesday November 29th, so don't forget to check back to see if you are the lucky winner. Good Luck!! This is super cute! I would LOVE to win this cart! Thanks for the chance to win!!!! And I'm already a follower! Thanks again for the chance to win!! And I "liked" ya on FB! Thanks again for the chance to win! My fingers are crossed! And Happy Turkey Day to you and your fam! I am already a following you! What is there not to love about Autumn? colored leaves, crisp air, harvest, family get togethers. and of course football! Autumn is such a lovely time. I love how it paints a beautiful picture and hugs you close with warmth with just a whisper of what's to come. I liked you facebook page too. I love your beautiful 3d card, I never thought of using the layers that way! I love fall because I have more time to craft! my fav fall is the changing of colors--just pretty with all various colors. Hi. I love the colors of the leaves, and the fresh autumn air. Thank you. I've been following you for a while now. I'd love to win the Autumn Cel. cart. It's on my list. I think your card is so pretty. I have to say, that is a beautiful bow. My fav thing about autumn is leaves changing color. T am a follower and a subscriber. I love everything about fall, but probably love the colors of the leaves the most. I just liked you on facebook and left a comment. I am an e-mail subscriber and I just started following you on Pinterest as well!! My comment about what I liked about fall was lost so I am adding it again!! I love all the colors of the changing leaves!! 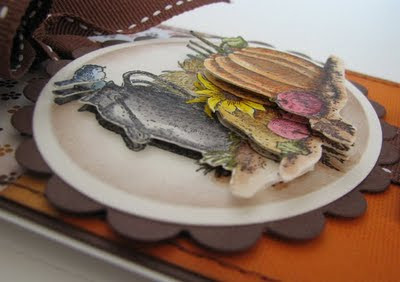 I really like your fall card and I pinned it! Thanks for the inspiration! I am heading over to FB to "like" you now! This would be an awesome cartridge to win since I have a ton of fall pics to scrap! Beautiful card - even if it isn't "new"!! My favorite thing about autumn is the beautiful colors - LOVE them! I'm already a follower...love your blog! My favorite thing about fall (in Hawaii - since this is where I live) is a little cooler weather and time of year we will soon be visiting family on the mainland! I'm already a follower of your blog. Love your Thanksgiving card. I'd love to be the winner of this great autumn cartridge. Hi Amy. I love autumn because it's such a nice break from our Florida heat and the beautiful colors and natural textures are a nice change too. I follow Scrappy Mommy as Tracy Suzanne on gfc. I liked you on facebook as Tracy Suzanne. I love the colors of fall! So rich! Thanks for a chance to win a great cart. love the card!! and i love the fall colors!! I am a email follower!! My favorite thing about Autumn would have to be seeing all the beautiful colors of leaves with the sun making them glow! I am an e-mail subscriber and enjoy seeing what you're up to! My favorite thing about Autumn is the colors... and then comes SNOW! I love the colors of Fall, the nice days and cool, crips evenings! Thanks for the chance to win a great cartridge! I have been a public follower for q while now. BTW--I love your card. I looked at the original post and the image source isn't listed. Can you tell me where the stamp is from? Thanks! What i love about autumn?? the colors, the crisp fall air, college football, and the beautiful lead-in to winter. thanks for the chance to win! love seeing the leaves change colors in the fall. i'm now a fb fan. My favorite part of autumn is seeing the leaves change colors and spending time with family at Thanksgiving. I love all the apples and pumpkins to make goodies with.